Clean and tailored design square bezel setting with princess cut diamond. A little more thought and effort was given when this pendant was put together. Instead of a simple one piece casting with rhodium enhanced areas, the pendant has been assembled from 2 sections. One part made in white gold and the other made from yellow gold. It’s a little more difficult and definitely more expensive making jewellery from multiple sections but the results are more flattering, longer lasting, more sophisticated and generally just better looking. 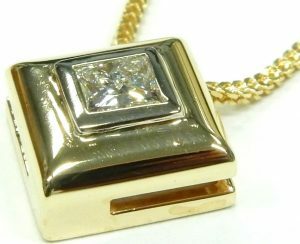 The square, flat edged pendant contains a very good quality VS2-I princess cut diamond. Only a thin bezel covers the diamond edges allowing as much sparkle as possible while making it look much larger than the estimated 0.30 carat weight would suggest. 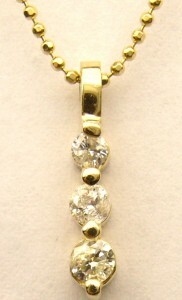 The pendant is suspended from a square section 14 karat yellow gold foxtail chain measuring 17 inches in length. Freshly polished and looking like new the pendant/necklace are estate priced as a set for $770.00 CAD. Stock #e10734. 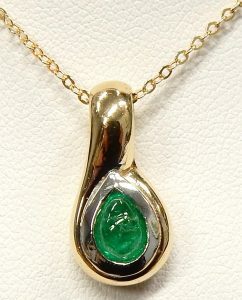 Cabochon cut emerald is seldom seen but judging from this tear drop shaped example it should be done more often! The natural emerald is a well saturated green that appears lit from within. It has been molded into the heart of a one-of-a-kind-drop pendant that carries the curving motif further. With all rounded surfaces the 14 karat yellow and rhodium enhanced pendant swirls around its center. The integrated bail droops like honey over the accompanying 16 inch chain. As a statement of its hand carved nature the pendant weighs an impressive 4.3 grams. Estate price $350.00 CAD. Stock #e11923. How can you go wrong with a little bling on a plunging neckline. These three diamond clusters are all hinged providing a little extra movement when worn. 21 diamonds total an estimated 1.00 carat in weight and are set in a very clever method. The 6 outside smaller diamonds overlap the larger centre diamond allowing it to be secured without any prongs that would otherwise limit some of the brilliance. This setting style will have onlookers convinced you’re wearing 3 large single stones rather than 3 clusters. It’s safe, secure, and a much cleaner look than the typical clusters you’ve seen before. 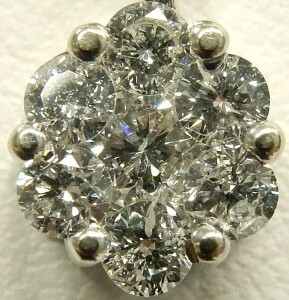 The round brilliant diamonds are very well matched. They’re bright, white little sparklers with I1 clarity and HI colour grades. Pendant section is constructed from 14 karat white gold and measures a little over an inch in length. A 20 inch 10 karat white gold curb link necklace is included. If you wish, a different style or length could be exchanged if 20 inches is a little long for your taste. Total weight of chain and pendant is 4.0 grams. Set is estate priced at $1,260.00 CAD. Stock #e9423. The time involved in assembling an item like this can significantly affect the price. There are close to 200 tiny cubic zirconia stones (imitation diamonds) used in the construction. Each and every one of the 1.3mm diameter faceted stones have been set by hand. Assuming each stone takes a couple minutes to set, that’s about a full work day of assembly time alone. Luckily this is an estate item and the original labor cost has already been paid for by someone else. 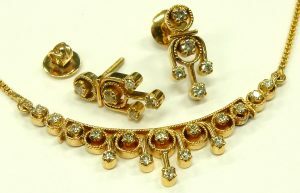 Despite not using genuine diamonds, this is a high quality piece made from 18 karat gold with a finished weight of 3.9 grams. 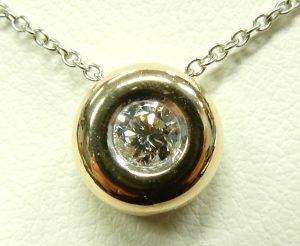 The pendant measures almost 1.5 inches from bail to point. Made from 4 separate sections with 3 joints that allow the inner hearts to move around sparkling just like high quality diamonds. In fact cubic zirconia actually have a bit more dispersion than a genuine diamond making big ones fairly easy to spot as imitations. Tiny ones like this are actually quite hard to tell apart from diamonds and in most cases actually look better and brighter than most average quality diamonds. Estate priced at $350.00 (chain not included). Stock #e9002. It is said that many of the greatest sculptors approach a stone with a mind empty of intention. They would study the rough marble and allow it to dictate the shape it would form. Such is often true for designer goldsmiths when they are presented with a phenomenal precious gemstone. They design a piece around the gem in a way that will bring out its highest potential. It’s hard not to envy the goldsmith that was presented with this natural 6.12 carat aquamarine, a very well saturated example of the pastel blue strain. 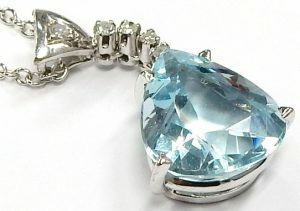 The exceptional gem has been custom cut into a triangular pear shape to maximize the intensity of its colour and the high brilliance that aquamarine is capable of. 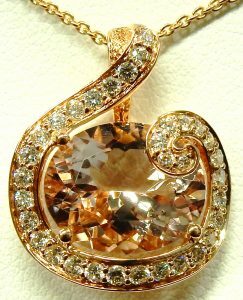 A cousin of morganite and emerald the gem is decently durable and certainly suited to the gentle wear of a pendant over the careless wear of a ring. 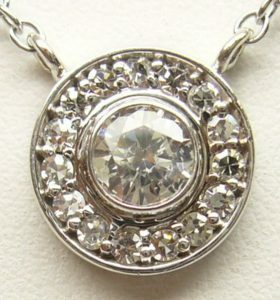 As such, a one of a kind 14 karat white gold pendant has been built around it. Measuring 27.5mm long and fully articulated the drop pendant has been built for maximum movement. 0.07 carats of round single cut accent diamonds have been added to accentuate the brilliance of the gem. 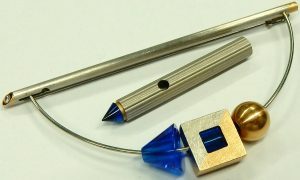 The prong tips have been formed into tiny triangles and the bail is a stylized layering of two triangles; all as a nod to the unique shape of the aquamarine. The statement pendant is estate priced for $2,380.00 CAD. 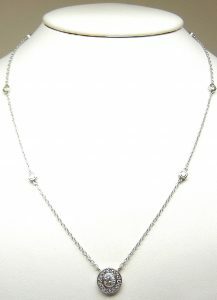 It is strung here on a new Tiffany’s style 16 inch long cable chain for an additional $250.00 CAD. Stock number for the pendant e11960. Whether you look at this as a religious symbol or just an attractive pendant with an interesting shape it’s hard to deny it looks pretty cool. The modified cross pendant measures just over 2cm x 2cm (excluding bail) and is suspended from a good weight 16 inch fox tail chain with lobster catch. The 8 bead set cubic zirconia show great contrast with the sky blue imitation turquoise. Pendant and chain weigh a combined 6.3 grams and are estate priced at $420.00. From the condition of this piece I don’t think it was worn any more than a few times. Stock #e7175. Diamond sliders are so classic they can be paired with anything. Done in brightly rhodium plated 14 karat white gold the bezel results in a seamless transition from fiery brilliance to a mirror finished shine. Bezel frames create the appearance of a much larger diamond, not that this diamond is anything to turn your nose at. With a high cut grade the 0.25ct diamond easily makes the most of its I1-GH quality, showing almost eye clean with a series of small reflected white crystal inclusions. The 7.8mm diameter pendant is strung on a heavier 18 inch long wheat link chain. Together the 14 karat necklace weighs in at 2.59 grams and is accompanied by a Harold Weinstein Ltd. Jewellery Appraisal with an estimated replacement value of $1,650.00 CAD. 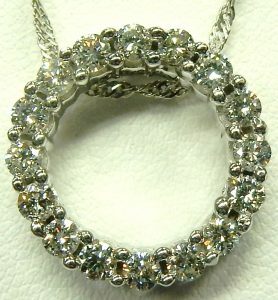 Our estate price for the like new necklace is $700.00 CAD. Stock #e11870. The artistic principle of asymmetry is often interpreted to mean inbalance but many highly skilled artists use asymmetry to create a more interesting form of balance. Often this kind of balance pulls the eye along a predicted pathway telling a story as it goes. Ancient Japanese painters were masters of this technique using many smaller points of interest to balance the larger focal point of the work. Such is the case with this unique pendant who’s focus is obviously the brilliant oval 4.14 carat peach morganite at its heart. But to get to that morganite your eye can’t help but start at the textured diamond studded bail. It quickly follows the graceful line of high quality VS-HI round brilliant cut diamonds finally ending in a playful swirl. That 0.40 carat total weight curving trail of diamonds is set into sturdy 18 karat rose gold that perfectly matches the tone of the sparkling morganite. All told this artistic piece of jewellery weighs 5 grams and hangs freely from a delicate 18 inch chain. Estate price $1,820.00 CAD. Stock #e10397. Birks Muse line is inspired by the patterned grill work of their original store on St. James Street in Old Montreal in 1879. Far from the grills that decorated that ceiling this teardrop pendant is made from the very best ingredients, but what else would you expect from Birks? The 39mm long by 16.25mm wide pendant retains a delicate feel with a subtly graduated pattern. 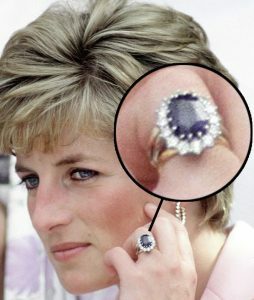 As proof of Birks’ thoughtful designs the 0.28 carats of VVS-FG round brilliant cut diamonds that circle the tear drops waist don’t actually disturb that filigree pattern; instead they create the largest point in the graduation by visually combining the two pattern halves it runs through. 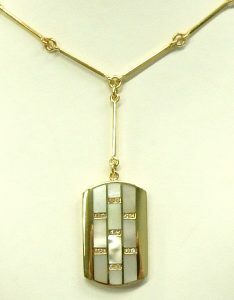 For a modern twist the pendant is hung from a double strand cable link chain that can be worn at 24 or 28 inches long. Even the hardware has been carefully designed with the solid rectangular bail allowing the teardrop to roll wildly during wear. The strong lobster clasp has been elegantly elongated and equipped with a swiveling end to help prevent the chain from twisting. All together the necklace consists of 10.7 grams of 18 karat white gold that still retains its untouched bright white rhodium. The like new necklace is accompanied by a luxurious Birks presentation box and is currently listed on their website for $2995.00 CAD. Our estate price $1,797.00 CAD. Stock #e10479. When it comes to pendants there are certain shapes and designs that are just perfect for the feminine form. This wishbone design is very flattering on an open neck when positioned just below the collar bones. The smooth organic shape looks like fluid in motion. A bezel set 0.20 carat round brilliant diamond of I1-J quality is the focal point, while a crescent shaped arrangement of 11 tiny round diamonds look as if they are keeping the whole assembly from opening up. Sometimes jewellery designers just nail it with a style and in my opinion this one has it. The rest of the necklace is pretty standard stuff. 3.6 grams in total weight including the 16 inch cable link white gold necklace with spring ring clasp. 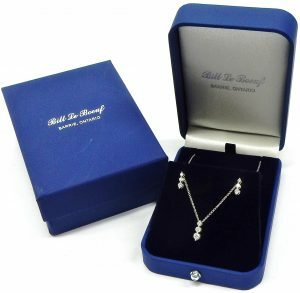 Brand new condition, ready to be presented in our blue with white satin presentation gift box. Estate priced at $511.00 CAD. Stock #e11065. People’s Jewellers Past, Present, Future series has been a staple line for them for decades. 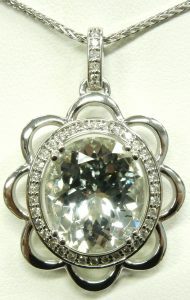 With this graduated quad diamond cluster pendant they’ve up the symbolism. The smallest four princess cut cluster represents the past, with the medium sized cluster for the present, and the largest representing the future; a symbol of the bright future ahead of you both. All together, including the accent diamonds in the bail and between each cluster, the pendant is set with 0.50 carats of sparkling I1-HI diamonds. The 30mm long symbolic statement piece is made from 3 grams of 14 karat white gold still retaining its original chrome white rhodium finish. Accompanying the pendant is an 18 inch long petite box link chain with spring ring catch. As with every estate piece it comes in our blue and white satin presentation box with complimentary gift wrapping if you wish. Estate price $473.00 CAD. Stock #e10509. This 1.47 carat old European cut diamond has been in our stock of loose diamonds for so long I no longer remember where it originally came from. Our goldsmiths stumbled upon it one day while looking for some antique diamonds for another custom project they were working on. Being diamond graders they were taken by how shallow the 8.18mm diameter by 3.12mm deep diamond was, almost resembling a flying saucer. Like many I2 diamonds this antique is full of small inclusions that are focused around the edge of the stone, leaving the area under the table facet relatively clean. 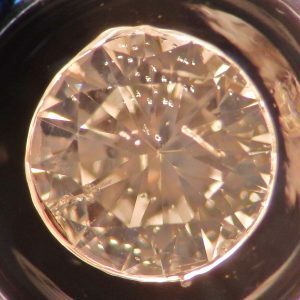 What makes these particular inclusions unique is the way they sparkle like glitter when the diamond moves, adding life and a silver tone to the diamond that actually enhances the antique appearance. Together they decided it was too interesting to stay locked away and designed this 6.7 gram 14 karat pendant showcasing its unique characteristics. To stay true to the antique theme they hand selected four more old European cut diamonds, 12 antique Swiss cut and a single rose cut in the bail to make up the one of a kind halo. Together the diamonds make for 2.70 carats of brilliant history. The brand new custom made pendant is accompanied by a brand new 16 inch 14 karat white gold box link chain. Estate price $3,990.00 CAD. Stock #e9795. Many wedding ceremonies refer to the unbroken circle that a wedding band represents, using the symbolism of a whole with no end or beginning as a parallel for the commitment made to one another. The same depth of meaning carries into the timeless diamond circle pendant. It’s always been marketed as a symbol of devotion, commitment, and oneness. Our circle pendant measures 16.3mm in diameter and contains 16 2.30mm diameter I1-I round brilliant cut diamonds. The pendant is made from 4.4 grams of brightly rhodium plated 14 karat white gold that virtually disappears under the 0.75 carat total weight of diamonds when viewed from the front. To not detract from the statement the circle makes, the pendant was designed with a hidden bail allowing it to slide across the 18 inch 14karat white gold Singapore style chain that accompanies it. Estate price $980.00 CAD. Stock #e9802. 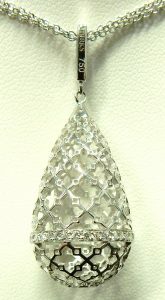 Unlike the delicate, filigree covered Art Deco and Art Nouveau inspired pieces we feature as often as possible, this pendant owes its design to a technique called pavé. The heart shaped outline is literally paved with tiny diamonds, all microscopically bead set as close and tight together as possible. Electroplated over the 14 karat gold with bright white rhodium and 0.20 carats of bead set diamonds, the only yellow gold left visible makes a big statement. The yellow gold edges of the bail gently curve into scrolled arches complimenting the chain. The 14mm heart is hung from a 10 karat, yellow gold, 16 inch long, Italian made wheat link chain. Total weight for the chain and pendant are 2.5 grams. Estate price for the set is $266.00 CAD. Stock #e10282. This is a large and heavy pendant measuring just under 6cm in height weighing 17.7 grams. 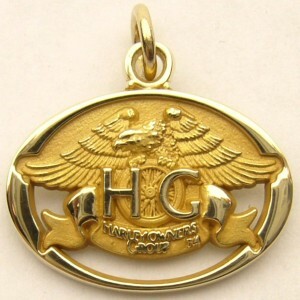 The yellow and white gold design appears hand made and tests approximately 14 karat gold. The large hinged bail is big enough to hold all but the heaviest chain you may have. 36 round brilliant cut diamonds decorate the centre and have an estimated total weight of 0.50 carats with a average quality of I1-J. Estate priced at $1,000.00 CAD. Stock #e7850. 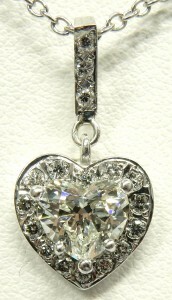 Simple and classic heart shaped diamond set pendant. The 22 round brilliant cut diamonds weigh 0.66 carats (total weight). The 10 karat yellow gold pendant is suspended by a 16 inch light rope chain. The total weight is 3.3 grams. The diamond quality is average at I1-K but look quite nice for the estate price of $470.00. That’s less than $22.00 per diamond. Stock #e6267. Who remembers what this shape is called? Having a hard time recalling all of those important things your middle school math teacher said you “needed to know”. This is a parallelogram and probably the only one you’ll ever encounter in 14 karat yellow gold! Weighing in at an exactly 2.00 grams the hand made pendant measures 20.7mm long, 17.15mm wide, and 10.1mm deep. The open wire-work box can be worn any way you imagine or threaded through the middle, allowing it to roll into different positions during wear. Use it as a pendant or keep as just an unusual object of modern art. The one of a kind quadrilateral is estate priced for $158.00 CAD. Stock #e11282. A statement making summer medallion hand crafted from the very best ingredients. Measuring 40.45mm in diameter this one of a kind three dimensional nature scene is cast with natural peridot, blue topaz, and two tones of amethyst. The reverse side is equally stunning, featuring an intricate saw pierced mandala. The over sized bail is patterned with a miniature butterfly on front and back to mimic its larger, coloured gemstone partner. With so much careful craftsmanship its no wonder the piece was made from top quality brightly rhodium plated 18 karat white gold. Accompanied by an appropriately sturdy 20 inch rope chain with a length adjustment for 18 inches. Together the necklace wears an unheard-of 31.3 grams. Estate price for a colourful masterpiece $2,531.00 CAD. Stock #e11037. Checkerboard is a pattern that has been used for every application imaginable including jewellery, but I’ve never seen it done this well. Imagine the time it took to custom cut 1.00 carat of VS-G or better diamonds plus 1.00 carat of top quality corn flower blue sapphires to fit into this heart shaped invisible set pendant. It would have been a meticulous task but well worth the effort considering the finished result. The sparkling white and blue pattern is made even more eye catching being set in warm 18 karat yellow gold. This is a very high quality item with the kind of colour you rarely see. Words can hardly describe the quality of these sapphires. You NEED to come in and see it in person. Suspended from from an 18 inch long fancy bar link chain the set weighs 7.5 grams in total. Estate price $3,500.00 CAD. Stock #e9439. It’s a mini disco ball for your neck. 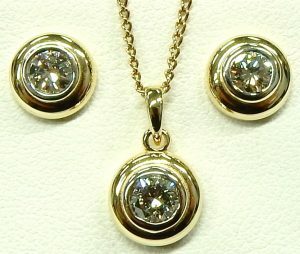 18 tiny little diamonds sparkle as the 10mm round pendant rolls on your neck. 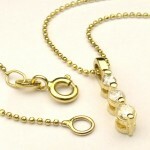 A round foxtail chain 16 inches long should place the ball just under the collar bones. This is a very contemporary design in new condition. A combined weight of 8.4 grams should give you some idea of the value this piece offers. A basic Italian made chain of this weight could easily sell for $800.00 or more. 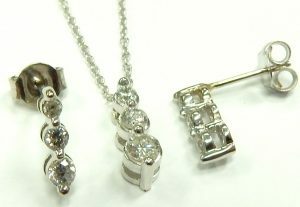 When you add a separate hand set diamond pendant the value really becomes apparent. 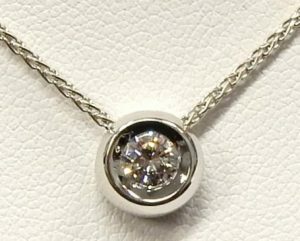 Even though the diamond weight is only around 0.07 carat in total, they are big enough to be noticed and add the finishing touch to the pendant. A sturdy and secure lobster catch is easy to use and much stronger than a basic spring ring. Estate priced at $560.00 CAD. Stock #e8756. Is it possible to be flashy and understated? 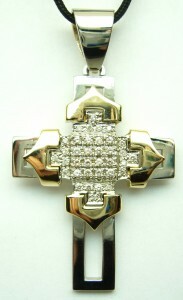 This diamond studded, brightly rhodium plated, 18 karat white gold cross somehow manages to pull off both. Its 18.0mm long by 13.5mm wide span is covered in 0.40 carats of high quality VS-G baguette cut diamonds. As is the case with baguettes the 10 bar set stones throw vibrant slivers of geometric white and spectral light. Their light show is comparatively calm compared to the blinding brilliance of round brilliant cut diamonds. Couple that with a hidden bail, low-key setting style, and clean design lines gives you a diamond studded cross that’s elegantly understated. 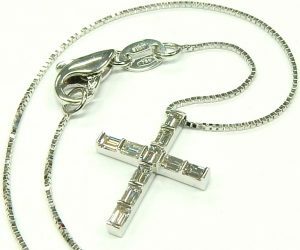 The cross is well paired with a geometric 16 inch long box chain with over-sized lobster clasp for easy fastening. Estate price for this high quality, never worn piece $840.00 CAD. Stock #e11114. 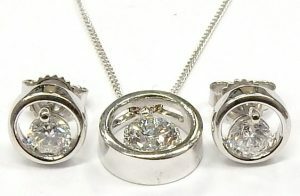 They’re not the biggest diamonds and they’re not flawless quality but for $238.00 it makes a nice presentation. At over 2.3 grams in weight this 14 karat yellow gold “snowman” style pendant/necklace is well made and in perfect condition. The I1 to I2 clarity diamonds have an average colour grade of J that looks just fine in the double gallery yellow gold setting. The ball style chain measures 16 inches long secured by a surprisingly strong spring ring clasp. 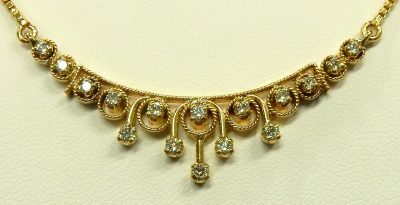 Yellow gold is coming back in style and this would make a very stylish pendant for the young lady in your life. Estate priced at $238.00. Stock #e8520. 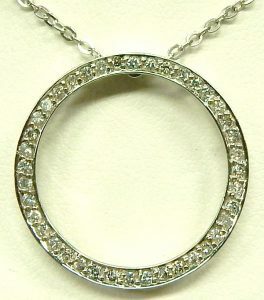 At 2.00 carats total weight this could be the biggest estate diamond circle pendant that we have ever had. The circle pendant is no longer just a trend, it has become a mainstay item for many people and is still one of the better selling designs. Measuring 33mm diameter this one will be hard not to notice. It’s just a little bigger than a Canadian $1.00 coin. Made from 4.8 grams of upgraded 14 karat white gold and hand set with 3 dozen well matched round brilliant cut diamonds of a pleasing I1-I quality. Not flawless but bright, white and full of sparkle. The circle pendant is suspended from a 16 inch 14 karat white gold Italian made cable link necklace. Both the pendant and necklace are in perfect condition showing no wear of any kind. Estate price $2,030.00 CAD. Stock #e9025. Believe it or not this is actually the same stone. 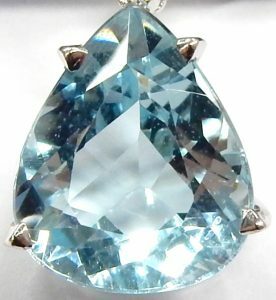 What used to be a soft reddish brown imperial topaz has turned into a very pale ever so slightly blue topaz. Exposure to sunlight through our triple pane laminated showcase/window glass caused the natural brown colour to permanently fade to the new pale blue hue you now see. A couple of pictures just doesn’t do this piece of jewellery justice. The large 8.86 carat imperial topaz sparkles and glitters so much more than still photographs can possibly show. Measurements of 14.3mm x 12.3mm should ensure this exotic stone won’t be overlooked. The big brilliant gem made the floral design setting a logical choice. Our goldsmiths came up with this fantastic lighthearted idea to showcase the large estate topaz. Soft scalloped edges and a string of tiny brilliant cut diamonds confirm the organic natural inspired design. Even the large hinged bail has been given the diamond treatment. 39 small brilliant cut diamonds weighing an estimated 0.33 carat of SI-HI quality form the frame and bail. The low double gallery setting was crafted using 14 karat white gold and weighs 7.0 grams. We love producing this type of jewellery. It’s always fun and refreshing for our team, as it pushes their creative ideas in a different direction from the often requested custom ring. If you have an interesting gem that just isn’t being worn often enough, bring it in and let’s be inspired together to create something exceptional. 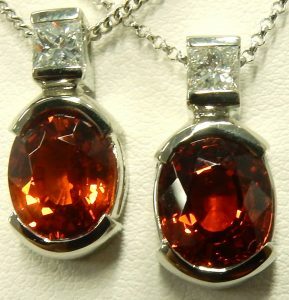 By the way, as the reddish brown imperial topaz this pendant was worth well over $3000.00. As the new pale blue common topaz the price is now about half (oops). Don’t leave your imperial topaz in direct sunlight as they can sometime fade. 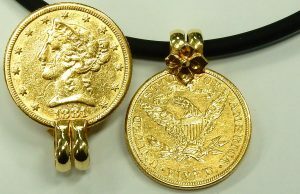 The pendant is estate priced not including chain at $1,540.00. Stock #e9304. Talk about a cute item. Not only is it adorable but this is a gift with a super high tear coefficient. 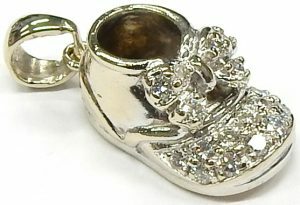 Just imagine her reaction when you present her with this tiny diamond set baby shoe. The tears will start flowing and you’ll be a hero. This little shoe measures 18.7mm long (not including the bail) and weighs 7.2 grams. Made from premium 18 karat white gold. If that wasn’t enough there are 19 little brilliant cut diamonds bead set in the bow and throughout the toe area. The diamonds are of high VS-H quality (one chipped) and total 0.44 carat in weight. It can be worn on a necklace or added to her charm bracelet. Estate priced at $900.00 CAD. Stock #e11674. Made to the highest of standards proudly in Quebec by St-Onge jewellers. St-Onge is a small boutique jewellery chain offering unique creations made exclusively in Quebec. From what I’ve seen online they have a very successful business manufacturing premium jewellery with operations in some of the provinces most trend setting fashionable locations. The lantern pendant reminds me of Celtic knot patterns. Cast from nickel free 18 karat palladium alloy white gold with yellow gold end caps. It’s a good sized piece measuring almost 2 inches long. Discretely set throughout the woven pattern are 10 small round brilliant cut diamonds weighing 0.03 carats each of very good VS-GH quality. A bezel set 4.75mm cabochon blue sapphire goes almost unnoticed on the bottom but provides the appropriate finishing touch on this piece of wearable art. Lantern pendant ST-P1160 is currently available from St-Onge and can be seen on the St-Onge website. 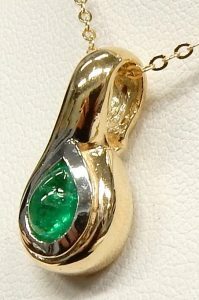 The pendant is priced at $2,450.00 (without a chain). Our estate example is in perfect condition looking unworn and comes with a high quality 18 karat white gold cable link chain measuring 20 inches long. The chain and pendant have a combined weight of 13.5 grams. Included with purchase is the original St-Onge fitted padded box. Even the packaging is a high quality item and has been made specifically to hold the lantern pendant. Estate priced at $1,770.00 CAD. Stock #e9586. When you hear ‘German made’ the first thing that pops into mind is efficiency and quality, and for good reason. Many German designers and goldsmiths have a dislike for white and rose gold as it is not a true form of gold, which only occurs yellow naturally. They prefer to use materials in their true forms, so it comes as no surprise that this set be made from 20 grams of top quality 18 karat yellow gold and grey white platinum. The uber modern three piece set is unlike anything we’ve showcased, allowing for a nearly endless combination of parts, creating a nearly endless variety of looks; limited only by the imagination of the wearer. The innovation of each piece is hidden in the details of closures and precision finishes, the more time you spend with the set the more you’ll marvel at the inventiveness of German engineering. The designer has used rubber cord and synthetic geometric coloured gems accents to bring colour, texture, and variety to each piece. For a finishing touch the tip of the pin bar has been flush set with sparkling round brilliant cut diamond. Estate price for the set $2,000.00 CAD. Stock #e10217. Anyone ever heard of Spessartite before? I didn’t think so. This gem is a rare form of the quite common garnet. When most people think of garnet a dark slightly reddish brown gem comes to mind. 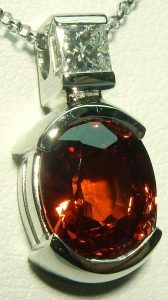 Typical good quality garnet is usually the colour of red wine. As with most gems there are anomalous colours that sometimes occur. With garnet the rare hues can literally be any colour of the spectrum except blue. Each of these oval faceted garnets weigh an average of 3.25 carats and each contain a nice quality 0.25 carat SI1-H square princess cut diamond. 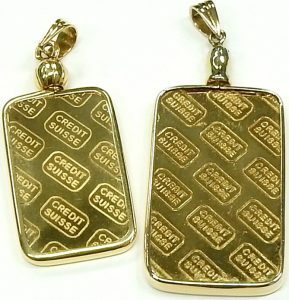 We’ve priced both of these custom made 3.4 gram 14 karat white gold pendants exactly the same. One stone is slightly bigger and one is a slightly better quality. It’s going to be a difficult decision which one to pick. Common garnet can sell for around $50.00 per carat while some very rare exceptional green garnets can sell for ten times as much. Orange to slightly brownish orange Spessartite garnets like these sell for somewhere in between. All garnets have a very high refractive index (the ratio of the velocity of light in a vacuum to its velocity in a specified medium). What this means to the casual observer is these things sparkle much more than almost any other coloured stone. As light slows down travelling through these stones it is bent and bounced back to your eye as visible colour and sparkle. There are very few gems that do this as well as garnets. Diamonds are one of the only gem minerals that have a higher refractive index than garnets, but good luck finding one in this colour and don’t even ask about the cost of such diamonds. You’ll not likely encounter another Spessartite again. 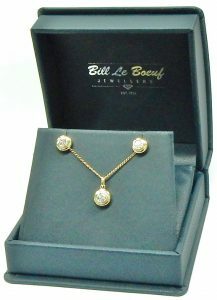 I can only remember one other example that has passed through Bill Le Boeuf Jewellers before. We’re going to let you decide which one to buy and what style of chain best flatters the pendants. Each pendant excluding chain is estate priced at $1,610.00. Stock #e9612 and #e9611. Name plate jewellery has been popular since the ancient Egyptians, when golden cartouche amulets were used to protect dead Pharaohs from evil spirits. We’re not sure if these three 10 karat yellow gold engravable discs carry any protective powers but they look great and are a great buy. Like new condition, scratch and scuff free. 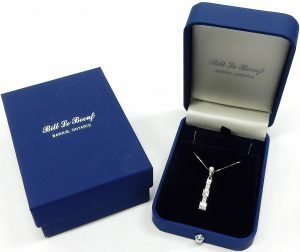 We can engrave a simple initial or a short secret message to someone special. Available separately. Estate priced at just $47.50 per gram. Stock #e10084. What a cute item. Not only is it cute but this is a gift with a really high high tear coefficient. 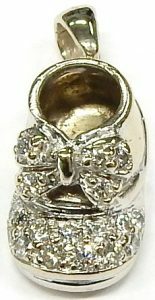 Just imagine her reaction when you present her this tiny diamond set baby shoe. The tears will start flowing and you’ll be a hero. 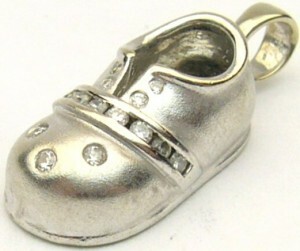 This little shoe measures 15.7mm long not including the bail and weighs 3.6 grams of 18 karat white gold. If that wasn’t enough there are 16 little brilliant cut diamonds channel and Gypsy set throughout the shoe. It can be worn on a necklace or added to her charm bracelet. Estate priced at $350.00. Stock #e8126. Without question of all the possible shapes brilliant cut diamonds can come in the heart shape has to be the most unique. Round, square, marquise, and pear seem just a little ordinary compared to a well proportioned heart shape. The Gemological Institute of American certified diamond weighs in at 1.04 carats and is one clarity grade from flawless. The I colour faces up quite white with no fluorescence. The diamond is framed in a white gold setting containing 17 small round brilliant cut diamonds weighing a combined 0.25 carats of very good VS-GH quality. A brand new 16 inch 14 karat white gold square fox tail Italian chain completes the necklace with a total weight of 3.3 grams. The diamond has been microscopically engraved with the GIA report number of 12229540. 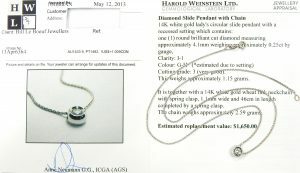 The report can also been seen at the GIA website www.gia.edu Estate priced at $6050.00. The loose diamond can be taken out and used in a different application is you wish for $5650.00. Stock #e7916. A past, present, future trinity of diamonds wrapped in an unending vortex of shinning white gold. The meaningful trio are made up of 0.25 carats of I1-J quality round brilliant cut diamonds in the slightest graduation. The understated slider pendant measures an occasion neutral 15.6mm in diameter; allowing the wearer to carry that secret promise of two lives entwined with them wherever they go. The meaningful pendant has been strung on an upgraded 16 inch long 14 karat white gold box chain which still retains its original bright rhodium finish. Estate price $420.00 CAD. Stock #e11444. Custom made, perfect condition looking unworn. Not a scratch or scuff to be found. Original rhodium plating completely intact. 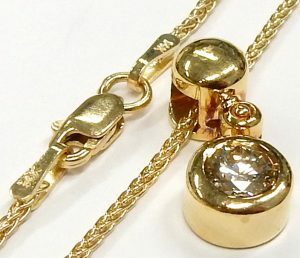 Italian made 16 inch rolo style necklace connects the 7 different diamond set “stations”. 6 bezel set 0.10 carat diamonds of SI-GH quality line both sides with a larger halo diamond cluster in the middle. The centre halo contains a 0.40 carat I1-HI brilliant cut diamond surrounded by 15 high quality (VS-GH) single cut diamonds. Single cut diamonds don’t really have just a “single cut” but actually have 17 individual facets compared to 57 on a brilliant cut diamond. Single cut diamonds are seldom seen in modern jewellery designs, which is too bad. Side by side many people actually prefer the look of them in diamonds weighing under 0.02 carats. Their simple facet pattern allows bigger more distinct flashes of brilliance. Modern technology allows cutting factories to manufacture brilliant cut (57 facet) diamonds as small as 0.0033 carat. These tiny sand grain sized brilliant cut diamonds sell for more than single cuts would so factories just don’t produce many nice single cut stones. Rolex still use single cut diamonds for hour markers on their watches, and I’m pretty sure they know what looks best. Single cut diamonds also give the pendant a more convincing antique look. 1.16 carats of bright sparkle, 4.6 grams finished weight, estate priced at $2044.00. Stock #e9200. Kokopelli is an ancient Mesoamerican fertility deity dating back from as least 850 AD. Kokopelli was said to carry unborn children on his back, distributing them to women. He is also associated with agriculture and his flute playing was meant to chase away winter and bring about spring. Standing 26mm tall this three dimensional depiction in 14 karat yellow gold doesn’t seem to be doing much to prevent our winter from coming. Perhaps it’s due to the unplayable nature of his flute. Either way the 4 gram carving with its iconic South American imagery carries with it thoughts of warmer places. Estate price $336.00 CAD. Stock #e11677. No one does the diamond circle pendant like Roberto Coin, it is absolutely their signature piece. Made solid and strong from high quality 18 karat white gold the circle features 0.42 carats of bright SI-HI round brilliant cut diamonds. Measuring 21mm in diameter the signed piece also features a hidden created ruby, as Roberto Coin’s Egyptian inspired secret gift meant to provide health, happiness and a long life. The sparkling halo hangs lightly from an Italian made 18 karat white gold 18 inch long rolo link chain, equipped with a 17 inch adjustment loop. Estate price $1,182.00 CAD. Stock #e10337. 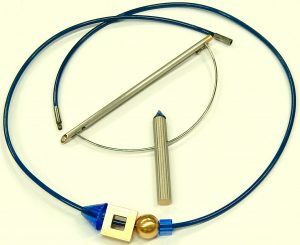 A lariat necklace is typically a longer necklace that you wrap or intertwine into itself. Tiffany’s 1837 Interlocking Circles Lariat can be intertwined in three different ways for three different looks. The playful 18 inch long necklace is unfortunately retired but ours is in like new condition and accompanied by its original travel pouch. Three looks for the price of one. Estate price at $180.00 CAD. Stock #e11928. This petite powerhouse of a diamond pendant definitely deserves today’s spotlight. Not because it carries any particularly exceptional diamond, although the very good cut 0.17 carat round brilliant cut is a super looking I1-H quality. It is almost completely clean except for 2 inclusions close to the edge at 12:00 and 8:00. The rest of the diamond sparkles brilliantly. Some I1 diamonds look waaaaaay better than others. I don’t think you’ll find a more attractive I1 than this example. The grade setting inclusion is mostly visible only when looking up from the bottom as seen in this photomicrograph. This inclusion is not a chip, it’s a naturally occurring cavity that was never polished away. It could be removed but the diamond weight would be significantly reduced. At this price point you simply can’t go wrong. When quality and price overlap like this the value is exceptional. Though we have a passion for big diamonds and take great pride in being a part of those major diamond milestones like graduations, engagements, weddings, and anniversaries. We also want to be your first diamond, that special piece from a parent, grandparent or partner that you treasure forever. This delicate 1.6 gram 14 karat 16 inch yellow gold necklace is ready to be the beginning of a lifetime of milestones for the estate price of only $187.50 CAD. Stock #e11260. With quality ingredients and thoughtful design this pendant takes the circle necklace to a luxurious new level. Opting for a more oval shape with a curved, undulating surface the piece immediately draws the eye for its uniqueness. Then the curved surface was completely covered with petite pave set diamonds of high VS-H quality. Those 136 hand set single cut diamonds come together for a 0.66 carats of total weight that sparkle from every direction. Made from 5.7 grams of brightly rhodium finished 14 karat white gold the pendant measures 22mm long by 21mm wide. Even it’s reverse side has been decorated with an oval themed lattice work. Thanks to a hidden bail the pendant slides freely across the sturdy 18 inch white gold chain that accompanies it. Estate price $1,120.00 CAD. Stock #e10576. The basic bezel setting is perfect for the person who likes a simple design that can be worn with 24/7 comfort. The sleek, protective rim of 14 karat yellow gold eliminates the possibility of catching on hair and clothing that can arise from a claw setting. 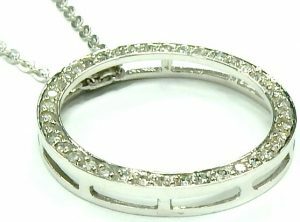 This particular bezel also happens to be permanently attached to the 16 inch long curb link chain that accompanies it. For lighter chains this can be a problem as the chain can wear out where it is attached to the pendant. Not an issue for this combo as the curb link is quite strong and robust. The benefit to this style is the integrated look blends perfectly with the bezel setting. The 16 inch total length should showcase the 0.37 carat VS2-I round brilliant cut diamond just below the collar bones. Estate price $963.00 CAD. Stock #e10308. 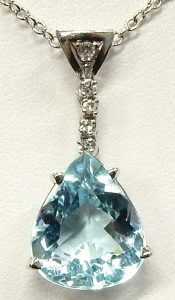 The Effy Ocean Bleu pendant features a unique free form faceted 6.30 carat blue topaz backed by a decorative pierced panther that peaks through the gem on close inspection. The 34.4mm long pendant is decorated with 0.24 carats of petite round brilliant cut diamonds of SI-HI quality. The pendant is suspended from an 18 inch 14 karat white gold cable link chain. This item is currently listed on Effy’s website for $2,995.00 on sale for $1,497.50. Our estate price for the like new pendant is only $980.00 CAD. Stock #e11635. If you’re looking to stray from the traditional, this pearl drop is as far as you can get from normal. Not only is it a statement making 12.7mm diameter in size but it has a soft slightly greenish grey body colour with the gentlest purple overtones. Perfectly round in shape the nacre only carries one natural dimple on its reverse side. The unique, high quality pearl is secured by an 18 karat white gold bail that can fit any chain or clip onto a strand of pearls or beads. The pendant rolls freely during wear and can be paired with jeans or a cocktail dress for the same elegant flair. 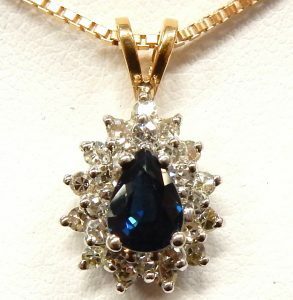 Estate price for the pendant without chain $490.00 CAD. Stock #e11637. The seed pearl starburst has been a favorite since the Victorian Era and we’ve seen our fair share of them pass through our estate department. An unfortunate few are ever in the condition to be sold as the demi pearls that adorn them are fragile and often missing or broken. This properly antique example arrived in untouched condition with every original pearl intact. Measuring 29.3mm diameter this starburst is both brooch and pendant. It’s equipped with a traditional hinged pin and catch and a hinged swivel bail for easy conversion. 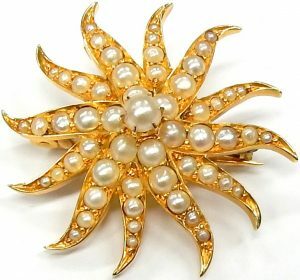 The piece has been hand set with 55 graduated white pearls which stand out softly against the warm 14 karat yellow gold. Estate price $490.00 CAD. Stock #e11689. This gender neutral set of Tiffany & Co. dog tags pair the Atlas line with the 1837 line to add interest to both. The deep contour that regularly adorns the high polished 1837 collection can be seen in its full force on the 33.25mm x 20.30mm tag. Layered with the deep lines and contrasting matte and polished finish of the 26.94mm x 15.30mm Atlas tag. The pair are strung from Tiffany’s take on the military bead link chain, made here from 925 sterling silver and measuring 20 inches long. 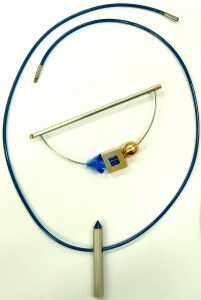 All told the striking necklace weighs 40.2 grams and is accompanied by its original travel pouch. Estate price of $350.00 CAD. Stock #e11430. At a collarbone hugging 15 inches long this high quality diamond necklace is the perfect high point for the layered look that is so popular now. With its rounded back it moves constantly during wear helping to best display the 0.09 carat SI-I round brilliant cut at its center. The heavy cable link chain and fixed bezel setting are made from 4.4 grams of premium 18 karat yellow gold. Ensuring you’re getting more than your money’s worth it’s estate priced at just $420.00 CAD. Stock #e11624. Invisible set diamonds bring a luxurious modern feel to everything they touch. The specialty cutting style allows the 27 princess cut diamonds to sit tightly against one another, creating an edge-less surface of brilliance. Those diamonds come together totaling an estimated 1.00 carat of I1-IJ sparkle. The 24.3mm long piece has been gracefully equipped with two fixed bails, which accentuate the subtle curves. Choosing to make the pendant from 8.3 grams of warm hue 14 karat yellow gold allows the diamonds to have an even bolder presence. The pendant is accompanied by a 15 inch long super sleek snake chain. Estate price $1225.00 CAD. Stock #e11235. Less is more has always been a successful look when it comes to diamonds. There is something very special about a simple solitaire setting, be it a round brilliant cut engagement ring, a stud earring or a basic square princess cut diamond pendant like this. 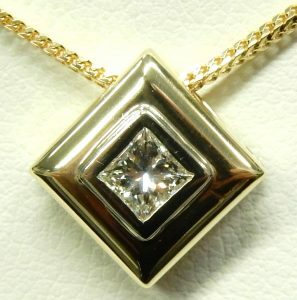 The 90 degree twist from square to “diamond shape” adds to the sophistication of the look. Secured in a simple 4 prong double gallery setting this 0.32 carat diamond twinkles as the centre of attention. Bright and lively with a better than it looks I1-J quality. Included with the pendant is a light 18 inch twisted rope chain. Perfect condition with original factory rhodium finish completely intact. Constructed in all 14 karat white gold with a finished weight of just over 1 gram. Estate priced at $420.00 CAD. Stock #e11801. 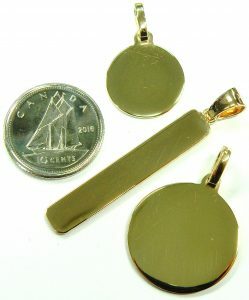 A little piece of the Northwest Territories encased in a timeless slider pendant. The 0.24 carat princess cut Canadian is a nice I1-F quality with a grade setting inclusion that fits perfectly into the brilliant facet pattern. The cushion shaped halo of diamonds are separated from the center with a high polish white gold inner frame, adding distinction to the crowning center. Those additional 16 round brilliant cuts bump the total carat weight up to a nice 0.35 carats. The slider and its 16 inch chain weigh together 1.7 grams and are in brand new condition maintaining their chromy rhodium finish. The diamond is laser inscribed to declare its origin and comes with a Canadian Diamond Birth Certificate. Estate price $553.00 CAD. Stock #e11339. I’m sure you’ve heard of Chocolate diamonds but did you know that term actually belongs to LeVian? They trademarked the term and built their brand around it, expanding the flavor based theme to create a language for their jewellery they call Levianese. 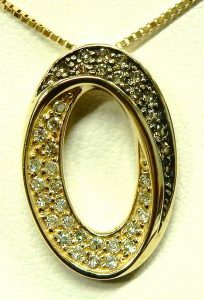 Their description for this particular pendant would be Vanilla and Chocolate diamonds set into Strawberry gold. It’s a unique approach to brand building and it seems to be working for them. Their X pendant is meant to “seal your style with a kiss”. It’s listed with a more delicate chain on Macy’s website for $2,200.00 USD on sale for Memorial Day at $780.79 USD. The initial price of $2,200.00 seams extremely high in my opinion given the value of the individual components and costs to manufacture the finished item. Unrealistic discounts are one way of promoting value but our policy is offering our best value all the time. The pendant measures 23.45mm long and 10.5mm wide. 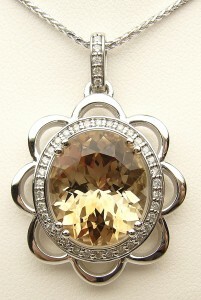 The statement making pendant is set with 0.50 carats of flavorful round brilliant cut diamonds. Well made from 3.2 grams of 14 karat Strawberry gold (4.6 grams total weight) the pendant slides freely along an 18 inch, 10 karat rose gold chain. 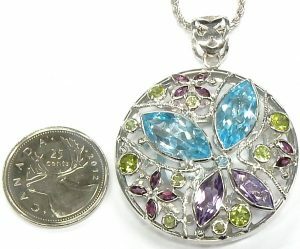 Our estate price for the pendant with necklace is $700.00 CAD. Stock #e11314. With jewellery, more than anything else, the devil’s in the details. Working in the small scale of a diamond solitaire pendant great thought and creativity are required to distinguish such a pendant from its fellows. With a floral filigree undergallery, gracefully curved split bail, and double prong setting this pendant is quite distinguished. The 0.23 carat round brilliant cut diamond it carries is a strong SI2-H quality. The diamond is made more brilliant by the untouched rhodium that covers the 14 karat white gold. 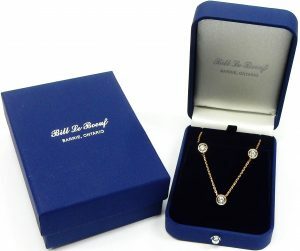 The pendant is accompanied by a delicate 16 inch long box chain. Estate price $455.00 CAD. Stock #e10594. We’d like to think our diamonds look better but the truth is, we just grade them accurately. I2 diamonds can and often look pretty good assuming they’re properly graded and not actually I3 quality. J colour diamonds too look really nice, when they’re actually J and not MN colour. 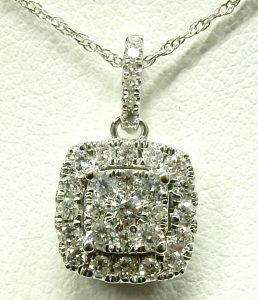 Our latest estate diamond pendant looks fantastic, especially when you consider it’s only priced at $348.00. The diamond measures a full 4.4mm diameter and is estimated to weigh 0.32 carats. 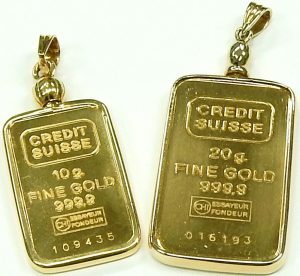 It is secured in a sturdy 14 karat yellow gold double gallery setting with a large bail that will accommodate almost any chain. 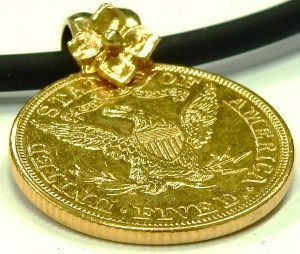 We are including a 10 karat yellow gold 18 inch necklace that contributes 1.0 grams to the 1.5 gram total weight. 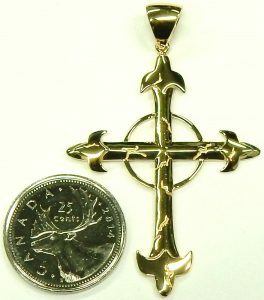 The pendant and chain are estate priced as a set for $348.00 CAD. 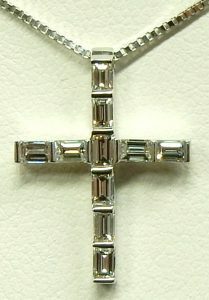 Diamond pendant available separately for $308.00. Stock #e11603. Sometimes we overlook the traditional little jewellery items that come in as we often showcase bigger, more expensive estate diamonds and watches. It’s easy to forget just how pretty and effective a simple design like this can be. A subtle pearl and diamond pendant is every bit as attractive compared to pieces costing many times more. You’ll see this style at pretty much every jewellery store you go to. Most try to manufacture it for the absolute lowest price resulting in a reasonable looking finished product but lacking any real value. These $99.00 10 karat gold creations have thread thin necklaces, dull pearls with a tiny opaque diamond accent. Our example almost didn’t make it to the estate pages of our website, but it deserves a few seconds of internet glory. Made to last and made to a higher standard but most of all, priced to showcase amazing value. The 6.8mm round Akoya cultured pearls has a deep, high quality soft creamy silver luster lacking any significant blemishes. A nice bright 0.045 carat round diamond of decent I1-J quality crowns the top adding a touch of twinkle. A more than adequate box link chain of 0.9mm width, 18 inches in length suspends the pendant in just the right spot. The total weight of the finished pendant/necklace is a substantial 3.2 grams. Yes it costs a lot more than $99.00 but comes with sooooo much more value. In like new condition and estate priced at $238.00 CAD. Stock #e10692. There’s not a single square millimeter of surface area you could possibly squeeze another diamond onto this pendant. In fact every single one of these diamonds are much smaller than 1 millimeter in size. The 187 round and square single cut diamonds are estimated to weigh 0.66 carat in total weight. They may be small in size but they’re pretty nice quality at SI clarity with an I-J colour. The square diamonds in the centre are all invisibly set with a border of claw set round stones forming the outside edges. This clever setting technique allows an unobstructed display of bling. 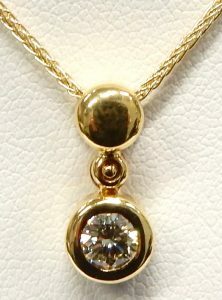 Despite containing close to 200 diamonds the 14 karat yellow gold pendant measures just less than 1.25 inches in height (complete with large triangular chain bail). Included with purchase is a 14 karat yellow gold twisted double curb link necklace measuring 18 inches in length. Total weight of chain and pendant is 5.3 grams. To give an idea of the great value this item offers consider this. 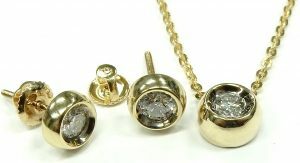 $910.00 divided by 187 diamonds makes each one cost less than $5.00 including the gold setting and chain. The necklace and pendant are in perfect condition looking unworn. No visible wear of any kind can be seen even on the chain bail where the necklace runs through. This area always shows wear over time. Have a close look at your own pendants. Chances are you’ll see a slight groove where the chain continuously slides in the connecting bail. Estate priced at just $910.00 CAD. Stock #e9087. The Bolo tie is (not surprisingly) the official neckwear of Texas, making it a culturally appropriate substitute for a necktie in that state. We know “everything is bigger in Texas” but I feel this one of a kind Bolo tie would impress even in the Lone Star State! Measuring a total length of 36 inches the unique mesh link made up of hundreds of petite circles can be worn in any way imaginable. The adjustable catch is always the centerpiece of a Bolo. Here it is decorated with 0.33 carats of VS-I quality tiny tapered baguettes in an elegantly stylized X. Each chain end is capped in a patterned gold drop reminiscent of the traditional silver caps on leather cord Bolo ties. As this statement necklace is made from 32.5 grams of 14 karat yellow gold it has been rightly secured with a plunger clasp with additional safety lock, and a clasping safety chain. Estate price $2,170.00 CAD. Stock #e11775. Remarkably bright and lively diamond despite the OP colour grade if fact I wouldn’t be surprised if it was lower than a OP colour. At that grade level it makes little difference in overall value. It really does look nice and the warm pale brown colour is actually very attractive. The diamond is very well cut with excellent proportions measuring 5.2mm x 3.2mm. Set in a traditional 14 karat white gold crown setting suspended from a 20 inch 14 karat white gold necklace. The pendant and chain weigh a combined 2.4 grams. Estate priced at $973.00 CAD. Stock #e8224. 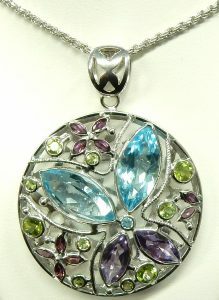 Forget that this pendant is one of the prettiest in the store right now; look at it like an objective appraiser would. Just the facts: 34 round brilliant cut diamonds that equal an estimated 0.50 carat total weight (2 diamonds are 0.15 carat each) all of nice looking bright I1-H quality. Weight of 3.8 grams, 14 karat white gold construction including the Italian made 18 inch box link necklace with sturdy lobster clasp. From this information it’s pretty easy for us to come up with an idea of what a competitive replacement value would be. From there apply a nice discount given the estate nature of the pendant and voila, you have the type of pricing that frustrates other jewellers and keeps our clients coming back. The navette shaped pendant measures 12.1mm x 7.3mm and looks like a single diamond of around 2.50 carats. The small diamonds are set so closely together you’d swear it was just a single stone. The pendant is suspended from a fluted bail that allows for some extra movement. Great looking design with that super popular halo look. Excellent condition and estate priced at only $700.00 CAD. Stock #e10922. A graceful piece from Charm Diamond Centres’ Glacier Fire collection. The draping ribbon of brightly rhodium enhanced 10 karat white gold flows elegantly down and around the Canadian diamond at its heart. The 0.08 carat I1-I quality round brilliant cut has been laser inscribed with a tiny maple leaf and unique serial number to state its glacial origins. The like new piece is accompanied by an 18 inch chain and luxurious inner and outer box. Listed on Charm’s website for $499.99, our estate price is $158.00 CAD. Stock number e11448. Some artisan goldsmith must have loved this smokey quartz a great deal, to have taken so much time creating a hand made pendant for it. The pierced trellis work and asymmetrical bail were all hand cut with a jewelers saw. Assembled from 11 individual parts the 18 karat yellow gold pendant is not made of robotic accuracy. It speaks to the hours of labor with tiny imperfections that give it charm. The earthy brown 29 carat smokey quartz has a whisper of forest green at its depths. Its facets flash a colour almost matching the unique gold tone of the metalwork that carries it. All told the pendant measures a statement making 25mm x 18mm and weighs 10.1 grams. We’ve strung it from an 18 inch 10 karat rope chain available for an additional $130.00 CAD. 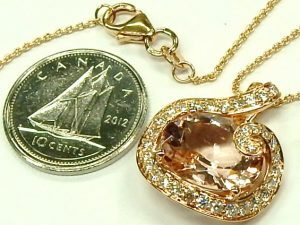 The pendant itself $490.00 CAD. Stock #e11565. Estate jewellery isn’t necessarily old and in some cases it’s never even been worn before. This piece falls somewhere in between. 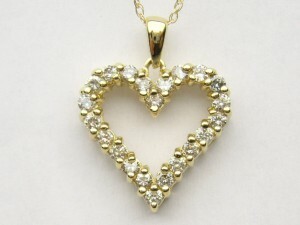 The heart theme is quite traditional but the design is very modern and the chain style looks like new. A double, bright cut rolo necklace measures 16 inches in length is secured by a heavy lobster catch you’d expect to see on a much heavier link. This clasp supplies way more security than this pendant requires and likely was upgraded. All the loops and connecting rings on the pendant are very robust contributing to a chunky look, it’s something similar to a creation you’d see from Tiffany. 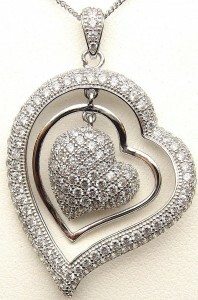 The small 11mm heart is pave set with 32 tiny single cut diamonds weighing an estimated 0.15 carats in total weight. It may be small, but this is a piece of high quality construction. Made entirely in 14 karat white gold, it still retains the original factory rhodium finish. A total weight of 4.3 grams will help assure you that the $350.00 estate price is great value. Stock #e9961. The Art Nouveau era of the late 1800s early 1900s is probably the easiest to identify at a glance, easier even than Art Deco which is often reproduced. Compared to the hand engraved, millgrain edged, and intricate pave stone setting of Art Deco, Art Nouveau would seem relatively simple; on inspection you’ll find it’s anything but. Each curling scroll is hand rolled; hollow formed leaves individually punched, pressed, and assembled; decorative settings hand pierced and cut; curving gold sheet, cut and bent across steel forms, all then assembled joint by joint. Take this 15 inch long neck piece for example, it’s made of 66 individual parts that had to be assembled section by section in careful stages. That doesn’t include the 8 hand set, well matched natural oval garnets that dominate the focus of the necklace. Announcing its commonwealth origins the whole piece is made from 9 karat yellow/rose gold. Together the antique necklace weighs 5.8 grams and is fastened with an original plunger style clasp. At over 100 years this heirloom piece is in remarkable all original condition. Estate priced at $490.00 CAD. Stock #e11535. These antique Art Nouveau necklaces have got to be some of the prettiest jewellery items we have. There are few pieces that are more attractive on the feminine neckline. Delicate Art Nouveau creations were often inspired by organic forms; flowers, plants and nature in general are often at the centre of the intricate patterns typical of the style. Leaves and vines intertwining in perfect symmetry is another common theme. It’s so nice to see an item like this necklace/pendant well over 100 years old yet in completely original condition. 16 inches in total length should have it fall to the perfect spot on a slender neck. We could always add an inch or two to drop in a bit lower if you wish. 64 tiny seed pearls decorate the blossoming floral spray design. 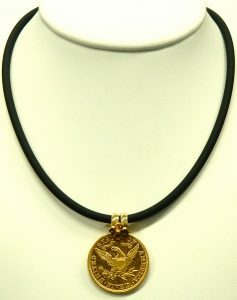 We usually have at least one or two other examples of this type of necklace in stock that are not showcased online. This example is made from 7.4 grams of 14 karat yellow gold and is estate priced at $700.00 CAD. Stock #e11027. The Queen of all Tiffany Key pendants is (in our opinion) The Daisy. Measuring 2 1/2 inches long and 23mm in diameter the Daisy’s size is head turning enough. Add to that the contrasting sandblasted/high polished finish building to a vibrant round brilliant cut diamond and you’ve got what Tiffany’s describes as “a beautiful beacon of optimism and hope”. The hefty silver pendant is currently listed without a chain on Tiffany & Co.’s website for $765.00 Canadian. 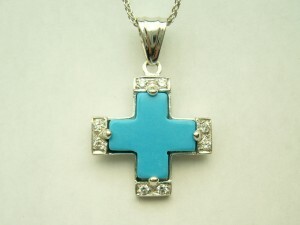 Tiffany sells the 16 inch sterling silver chain separately for $80.00. A September 2017 service receipt from the Bloor Street Toronto location is included along with that iconic blue travel pouch. Estate price for the chain and pendant is $550.00 CAD. Stock #e10944. 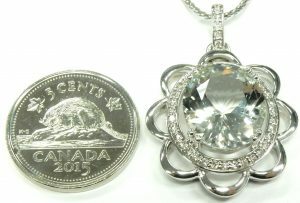 It’s possible to get a significant sized Canadian diamond pendant and chain you can be proud of for only $560.00 if you know where to shop. The minimalist 3 prong 14 karat setting does a great job flattering the 4.35mm diameter diamond. Pendents don’t see a lot of wear and tear, it comes as no surprise that this one is in like new condition. Comes complete with a 10 karat yellow gold 16 inch twisted serpentine necklace. The bright and lively diamond is estimated to weigh 0.30 carat and is of I1 clarity with an I colour. Pendant and chain weigh a total of 2.9 grams. 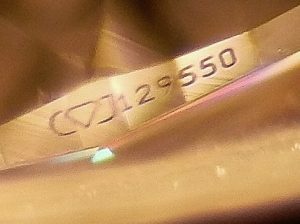 Like all Canadian diamonds this one has a unique registration number microscopically laser engraved along the girdle edge. Estate priced at just $560.00 CAD. Stock #e11666. Despite the weather in southern Ontario the calendar says spring arrived more than 2 weeks ago. Even if it’s well below freezing today, maybe this little butterfly amethyst and diamond pendant will help get you into a springtime frame of mind. The warmer months never seem to last long enough. If there is anyway of extending the feeling, even if only in a psychological manner we’ll give it a shot. 20 plus inches in length, 10 karat yellow gold, 3.8 grams in total weight, one tiny diamond bead set in the butterfly and of course those 2 rich purple amethyst drops. The amethysts measure 8mm diameter and each weigh around 4 carats. The amethyst and butterfly are suspended from a popular style cable link chain that is very sturdy yet infinitely flexible. A slight diamond cut bevel has been machined into the oval links giving the entire necklace length a subtle little twinkle when the chain rolls on the neck. It’s a fun little piece in great condition and estate priced at only $175.00 CAD. Stock #e11222. Are you trying to cultivate an optimistic outlook on our harsh and heavy winters? Perhaps a reminder of the intricate and impermanent little crystals that make up those magical winter nights will help. Staring at this over sized silver representation you can almost imagine yourself, enclosed in a heavy down coat, listening to the whisper quite impact of snowflakes falling lazily from the clouds. Measuring 25mm wide this solid silver snowflake is still smaller than the largest single crystal flake ever recorded (76.2mm from tip to tip). The Tiffany and Co. staple pendant has been retired and replaced by this years model but the impression is still the same. The pendant is strung from Tiffany’s signature cable link chain measuring 18 inches long. Estate price $150.00 CAD. Stock #e11537. Here’s hoping we don’t shortly get a cease and desist letter from the all powerful Walt Disney Company as this miniature Mickey is a licensed representation. He proudly displays his copyright across his back and from his quality its not surprising he was produced in house! Including the chain he weighs in at an impressive 3.9 grams of 14 karat yellow gold. He is quite heavy considering his mere 18mm stature. Mr. Mouse is coincidentally celebrating his 90th birthday this year! To do this nonagenarian the justice he deserves we’ve attached him to a high quality 14 karat yellow gold Birks chain with a sturdy lobster clasp for easy fastening. Estate price for Mickey and chain $333.00 CAD. Stock #e11453. The “V” necklace is a very flattering design that looks great with any low neckline outfit. The hinged joints allow the piece to follow every contour and also keep the links from rolling. The 14 karat white gold necklace weighs over 20 grams. A 0.15 carat diamond centre piece I1-J quality secured in a simple bezel setting completes the look. Measuring 17 inches long and secured by a tight fitting and secure plunger clasp with side safety catch. This item is in like new condition still retaining the original manufactures rhodium plating. Estate price $1,200.00 CAD. Stock #e8303. Robust is hardly a word you’d associate with a locket as they are often made extremely light and delicate. In the case of this 40.5mm long by 18.5mm wide locket robust is a very appropriate description. Weighing a substantial 6.9 grams the 10 karat yellow gold piece is still hollow, as it needs to be a practical weight but it has been very well made. It’s no surprise that it was made in Canada. Most pendants of this size would weight only around 3 grams or so. The tear drop shaped locket is in brand new condition and comes accompanied by a 20 inch long box link chain. Chain and pendant weigh a combined 8.6 grams. A beautiful keepsake for the estate price of $480.00 CAD. Stock #e10508. When I think of estate jewellery this is an item that immediately comes to mind. Hand carved shell cameos like this really showcase the art of jewellery and the skill of the craftsman in one piece. Each shell has different levels of colour that can be used to shade or highlight areas of the image. The example in this 10 karat yellow gold version is a more traditional theme of a woman’s profile. This piece was selected for today’s post not only for the quality of the carving but the quality of the bezel setting and frame. The frame itself has a nice example of hand engraving around the entire circumference. The rope work edging with mill grain detail are time consuming elements not always seen in antique jewellery. The Canadian department store Eatons sold this item originally at a time when they were known for some high end products. 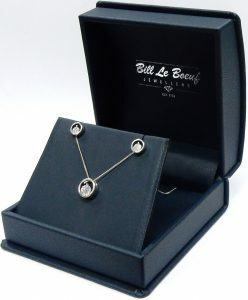 The brooch can also be worn as a pendant by using the hidden fold out bail. Weighing 11.3 grams in total and measuring 40.0mm x 31.5mm the cameo is estate priced at $420.00 CAD. Stock #e8212. High quality construction in 14 karat white gold with a beautiful hand engraved wheat pattern and milgrain edges. The wishbone design resembles two crossed feathers. Looking almost spiritual in nature the pendant was most certainly a commissioned custom piece. The highlight of the pendant is of course the twinkling round brilliant cut diamond nestled gently between the feathers. Weighing just a little less than half of a carat its size throws an ample display of brilliance and dispersion. Perhaps by chance but I prefer to think it was done more by design; the I1 clarity designation was determined because of a white “feather” type inclusion. The feather inclusion is difficult to see without magnification but it is there paying homage to the overall theme. 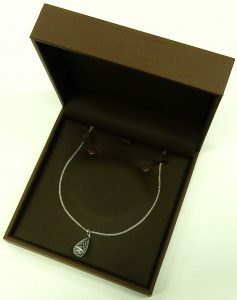 Included with purchase is a brand new 16 inch rolo style necklace made by UnoAerre Italy. Necklace and pendant weigh a combined 4.3 grams. The pendant looks like new showing little evidence of any use. The bail doesn’t show even the slightest groove from where the chain runs through. If the supplied 16 inch chain is a little short we’d gladly exchange it for something a little longer. 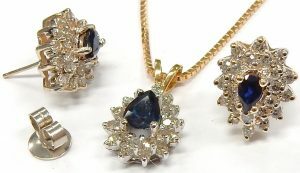 Pendant and necklace are estate priced as a set for $980.00 CAD. Stock #e8926. This isn’t one of those diamond pendants you see at the local discount jeweller that looks more like frozen spit than a sparkling diamond. Truth is it’s a pleasant looking round brilliant cut diamond measuring a very visible 4.0mm diameter. We’ve estimated the weight at just under 1/4 carat. The vertical white feather on the right hand side sets the I1 clarity grade and we’ve estimated the colour at a very nice H. It dazzles and twinkles better than any $225.00 diamond solitaire pendant ought to. For only $225.00 it comes set in a robust 14 karat white gold double gallery setting suspended from a 16 inch 10 karat white gold chain. The finished weight of the pendant and chain is 1.2 grams. 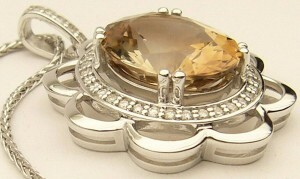 This estate pendant is priced under its new replacement wholesale cost. Come in and have a look at the sort of value our estate jewellery offers. Estate priced at only $225.00 CAD. Stock #e11454. Tiffany has very recently started to reinvent their iconic Return to Tiffany heart charm, embellishing it with graffiti like accents, zodiac symbols, and splashes of bright colour. But there’s nothing like the original and the over sized pendant makes a classic statement all its own. Measuring 30mm length the heavy heart shaped tag is accompanied by an extra long 34 inch Tiffany ball chain with lobster clasp. 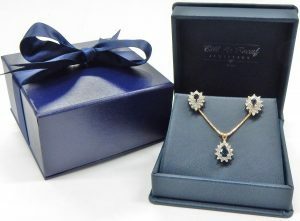 The sterling silver set is listed on Tiffany’s website for $350.00 Canadian. Our estate price including its little pouch $204.00 CAD. Stock #e11452. It is becoming a fairly common occurrence for items well over a century old to pass through our estate department and it’s such a treat to showcase them. Not only do we get to handle pieces that belong in museum cases but we get to explore first hand the techniques used by goldsmiths of the 1800s. Artistic masters who were creating highly technical works without half of the equipment available to modern jewellers. 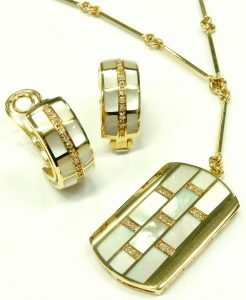 Pieces made in this time period don’t carry the price points of most diamond encrusted platinum Art Deco items. Often featuring brightly coloured glass as their center pieces and decorated with petite seed pearls. Considering their age they sometimes need some refurbishing but for us it is a labor of love. To give something so beautiful a second chance at life with someone who appreciates its history as much as we do is well worth the work. This medallion brooch/pendant is a radial and intricate flower, hand made from 5.7 grams of rich 14 karat yellow gold. The 27mm diameter statement pendant will make a stunning conversation piece. Estate price $560.00 CAD. Stock #e11226. We seldom get these spectacular Canadian gems and it’s always fun to show them off when we do. Ammolite is a rare opal like gem found along the eastern side of the Rocky Mountains mostly in Alberta Canada. 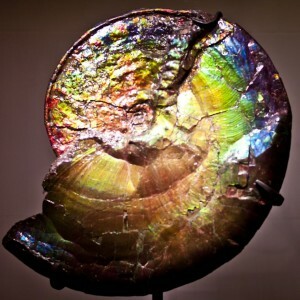 They formed from the fossilized shells of the long extinct Ammonite. They were a swimming shellfish similar to the modern day Nautilus. Some of these tentacle equipped creatures reached sizes of over 4 feet diameter. Although they went extinct with the dinosaurs millions of years ago they left behind some of the most colourful gems around. Available in almost every colour of the spectrum they are most often seen in an iridescent dark green colour with orange, red and yellow highlights. Quite often they show a crocodile type pattern and our example is no different. The 14.5mm x 5.5mm tablet cut is bezel set in a simple rectangular frame. 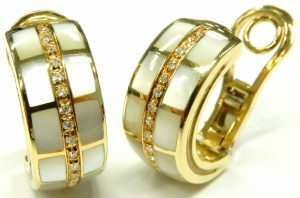 The yellow and white gold frame setting has been bead and bezel set with 16 small diamonds totaling 0.10 carats of I1-I quality. The large hinged bail will fit almost any chain or even a small pearl necklace. We’ve hung the pendant from a simple rubber cord giving the piece an even more edgy modern look. Perfect like new condition not showing a single scuff or scratch on the stone. 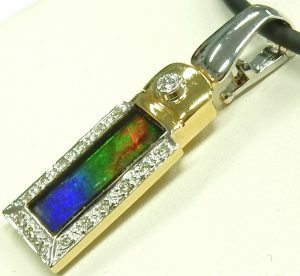 Ammolite are soft delicate gems best used in pendant applications. Only clean ammonite jewelry with a soft, dampened cloth to gently wipe the surface. Avoid ultrasonic cleaning, detergents or chemicals. 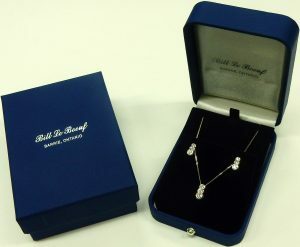 Necklace and pendant are estate priced at $560.00 CAD. Stock #e11176. A study of the soft pastel colour palette of pearls. The Neapolitan trio start with a soft blush tone, move to bold golden cream, and finish on classic pure white. The cultured pearls graduate from 7.6mm down to 6.1mm as they balance precariously along a winding diamond center stripe. That graceful line also graduates delicately along its 37mm length. 0.15 carats of SI-H round brilliant cuts are individually set into top quality 18 karat white gold which still retains its untouched chromy white rhodium plating. The like new pendant slides freely along its 18 inch long cable link chain. Equipped with an easy to fasten lobster clasp and two length adjustments. This versatile piece will dress up any outfit. Estate price $693.00 CAD. Stock #e11246. Swifts and swallows were common subject matter for the late 1800s Art Nouveau movement. Known for lightning fast aerial pursuits, it’s hard to see the outline of one without picturing those hair pin turns. Goldsmiths and artists of the period were forever trying to capture movement in their work, these birds were a perfect solution. In this 4.4 gram, 14 karat yellow gold necklace the loving pair are coming together to capture the purple glass gem at the hearts center. For more literal movement the elongated royal purple glass drop swings freely from the hearts point. Decorated with period correct petite seed pearls, equipped with a 17 inch long chain and modern sturdy lobster clasp. Antique and ready to wear for the estate price of $403.00 CAD. Stock #e11206.